Something you want to get off your chest before March 29? You’re not alone. In the countdown to Brexit there’s been a lot to say, or shout, or passive-aggressively post about online. Now, though, there’s an altogether more cultural way to express your woes. Artist Joe Sweeney is collecting a permanent archive of public opinion as we prepare to leave the EU. ‘+44… Leave a Message for Europe’ is a collaborative, public artwork, made up of messages left by members of the public at this [insert your own adjective here] time in our country’s history. You can add your thoughts, feelings and opinions to the project by dialling in on the project’s website. If you’re not sure what to say, head to the barren wilds of Dungeness beach in Kent to reflect. You’ll find a sculpture of a ’90s-style phone box that Sweeney has installed there. 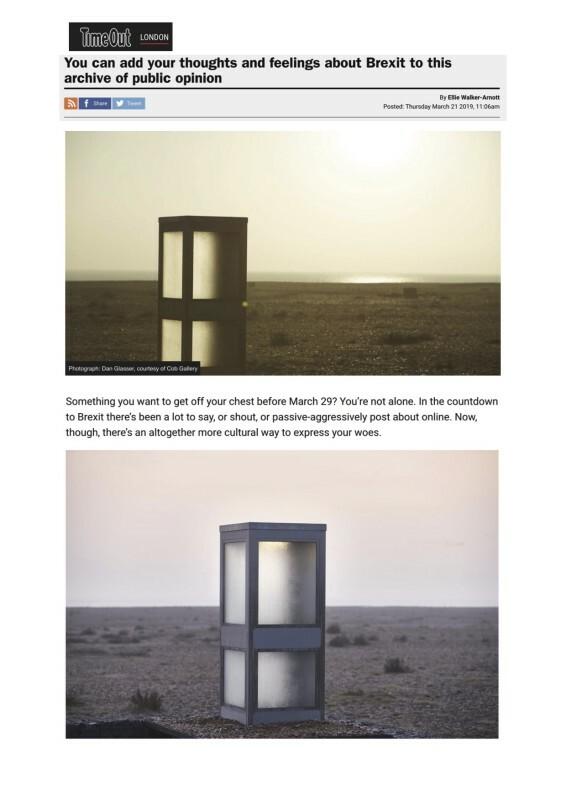 Located at the UK’s most south-easterly point, the inactive phone box is a reminder of the power of using your actual voice rather than, you know, an Insta story to connect with other human beings. The box will be on the beach until midnight on March 28 (which, at the time of writing, was the start of B-day) but you’ll still be able to add your voice to the archive if Brexit is postponed.